The day she was born, you dreamed of all that lay ahead. Youenvisioned a gracious young girl-the sort & ;of daughter other parents admire-one who knowshow to make charming conversation and when to hold her tongue. Polite and considerate,your daughter would know exactly how to behave, whether she was at the balletwith her grandmother or in the stands at a Friday night football game. But thattiny pink bundle wasn't born knowing the finer points of being a lady. Sheneeds your guidance . . . because honestly, she'll never know how much perfumeis too much or how much gratitude is too little if you don't explain. Explorethese timeless fundamentals of grace, thoughtfulness, and appropriate behavior,and pass along the lessons to your young lady in-the-making. The day she was born, you dreamed of all that lay ahead. You envisioned a gracious young girl?the sort of daughter other parents admire?one who knows how to make charming conversation and when to hold her tongue. Polite and considerate, your daughter would know exactly how to behave, whether she was at the ballet with her grandmother or in the stands at a Friday night football game. But that tiny pink bundle wasn?t born knowing the finer points of being a lady. She needs your guidance . . . because honestly, she'll never know how much perfume is too much or how much gratitude is too little if you don?t explain. Explore these timeless fundamentals of grace, thoughtfulness, and appropriate behavior, and pass along the lessons to your young lady in-the-making. 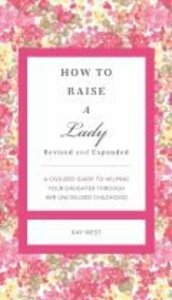 About "How to Raise a Lady"
Kay West has been working in and writing about country music for over twenty years. She has been a columnist, feature writer, and restaurant critic for the Nashville Scene for fifteen years and has been voted Best Feature Writer in Nashville for three consecutive years by readers. She also writes for People, Nashville Lifestyles, and NFocus magazines and is the author of two previous books, How to Raise a Gentleman and How to Raise a Lady. Kay lives in Nashville, Tennessee, with her two teenaged children. Unavailable. We are unsure when this item will be available to ship. eBook is Available.